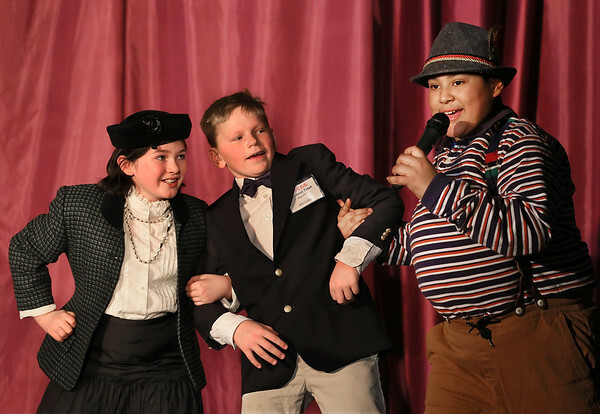 From left, Alison Merchant as Mrs. Gloop, Vladimir Ouelette as Phineous Trout and Teo Mahon as Augustus Gloop perform a scene during a dress rehearsal of the fifth grade musical, "Charlie and the Chocolate Factory," at East Gloucester Elementary School. To prepare for the production, students participated in a school-wide project to read the book the play is based on. The play will be presented to the public Friday at 6:30 p.m., Saturday at 2 p.m., and next next Monday, March 20, at 6:30 p.m.